Pretend Heroes: New Campaign "When the Trees are Teeth"
I want this to be a game where all the tropes of the genre find a place to live. Treasure chests filled with jewels, undead monstrosities rising from sarcophagi, trapped thrones, sleeping dragons, bound demons, clockwork machinery, and heroes coming back to town with piles of gold tied to the mules. What one person may consider cliché, I consider archetypical. The characters that are appropriate to this campaign are just as archetypal. I want the warrior standing before an approaching horde, his faith in blade and ally. The spell-caster will be wresting the secrets of the gods and the universe from hidden artifacts and moldering tomes. There should be a clever survivor, living day by day on wit, guile, and luck. This campaign needs characters that hearken to the traditions that made D&D. We will begin at Drafton, a small mountain-town of about 600 people. Most of the residents are self-sufficient trappers, farmers, and goat-herdsmen. 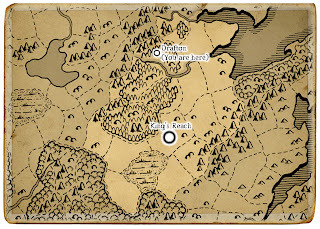 There was a road that connected Drafton to the region’s most populace city, King’s Reach, but it was used so rarely that nature reclaimed it. 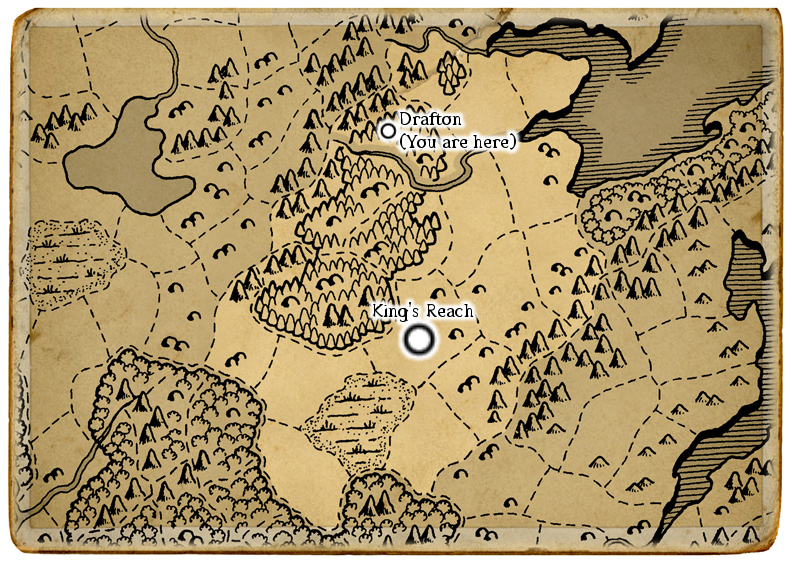 Technically a fief, Drafton is under the vassalage of Sir Ruchard Brines, who has neither visited Drafton nor demanded taxes. The tiny region is simply beneath his attention. The people have carried on in Drafton as they have for decades, uninterrupted by the outside world save for the slow trickle of adventurers who wish to try their luck in the ruins of Yggaril. Yggaril is an ancient ruin dug into the side of the mountain by a clan of dwarves. The mountainside is pocked with entrances to this dungeon, and horrible creatures are known to crawl out from these hidden places. The most innocuous of these creatures are small, yipping creatures that make frequent excursions into the goat herds. These creatures are little more than pests to the people of Drafton, but everyone knows that more heinous creatures stalk the woods. I really enjoy that map. Thanks Jon; I am using it for a slightly obscured hexcrawl!